The first time I crossed the border between Northern Ireland and the Irish Republic it was the summer of 1992, and it looked exactly like these pictures, taken at roughly the same time and in the same place, along the M1 motorway that connects Belfast and Dublin. My wife and I were there on holiday, and we had decided to take a swing through the border counties of Northern Ireland en route from Connemara and the Aran Islands to Dublin. Crossing into the north in our little rented Nissan Micra was a simple proposition. The border station near Belcoo, between Sligo and Enniskillen, was deserted. The booths were empty, the gates raised. Not a soldier nor customs agent was in sight. Given that earlier experience, the British Army checkpoint on the M1 came as a shock of sandbags, soldiers, and machine guns. The last time I crossed that border, this time by bus, was a year ago and the only indication that I had passed out of one country and into another was the change in carrier on my cellphone. I will be back there again at the end of this week, this time traveling with my son, who will turn 18 on the overnight flight across the Atlantic. He’ll be the same age as many of those British soldiers who trained their guns on us as we crossed the border back in 1992, and likely the same age as some of the IRA volunteers who blew that checkpoint up with a 2,200 lb. bomb in May of the same year. When we cross the border on our way to Belfast, it could very well be one of the last times that the border will still exist in essentially name only. With Britain voting to leave the European Union, of which the Republic of Ireland will remain a member, the reimposing of a hardened border may well be one of the most visible signs of the new Brexit reality. If the United Kingdom really wants to reestablish strict border control, which was the emotional heart of the case for pulling out of the EU, then the UK will have no other choice than to restrict the Northern Irish border lest the unrestricted migration within the EU spill into the UK through this obvious back door. Germany’s Chancellor Angela Merkel has declined to back a special arrangement suggested by the Irish government that would allow the soft border with Northern Ireland to stay as is should Britain follow through with Brexit. 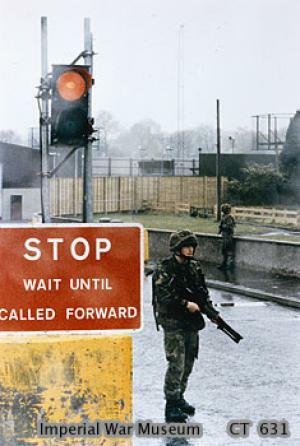 It won’t happen over night, but assuming Britain invokes Article 50 of the EU treaty and begins the formal process of withdrawal, the border as it stands today will be fundamentally changed, and gone with it will be many of the other unseen structures and dynamics that have contributed to the almost 20 years of peace bought by the Good Friday Agreement. Should this happen the unseen border will once again be seen, with all that connotes. Perhaps it won’t feature as many soldiers, sandbags, or machine guns, but it certainly won’t be the invisible reality of today, marked only by a notification on your cellphone.